L’ART SOLIDAIRE, a non-profit visual art exhibition of Dubai students is organized by the French Embassy in the UAE and presented at Art Sawa. Since October 2010, the UAE has officially been a part of the International Francophonie Organization. Therefore, this project, Art Solidaire, aims to further enhance the cultural and linguistic values of Francophonie amongst the youth of Dubai. L&rsquo;Art Solidaire involves approximately 200 students across Dubai schools, focused on the theme of Francophonie, solidarity and the UAE. The project has enabled students to rediscover the meaning of Francophonie and how its main goal, which is solidarity, can be enlightened across the UAE. With the support of their French and Art teachers, students have spent two months researching francophone artists and their art movements, including the concept of solidarity and its diverse means of expression. Furthermore, they have also learned about the different cultural aspects of the UAE and explored various artistic techniques in order to best express, on an A3 canvas, the fruit of their thoughts about the given theme. 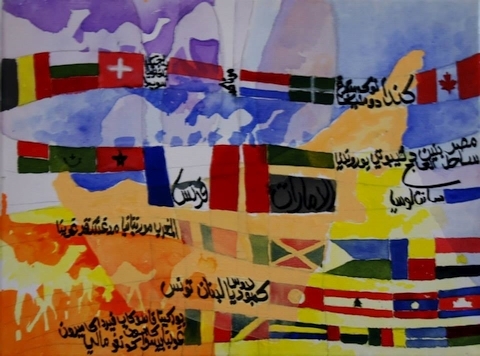 The Art Solidaire exhibition showcases a selection of the finest canvases which succeed eloquently in representing the students&rsquo; vision of the intricate link between Francophonie and solidarity in the UAE.